ARB roof racks are built to support the full rated roof load capacity of a vehicle with the mounting system and structural integrity of the rack being designed to withstand the most demanding of conditions. ARB racks are available in a variety of lengths and widths for vehicles with or without gutters, so you can choose the appropriate size to suit your requirements. Supplied with stainless steel hardware, and variable height fitting kits, an ARB Roof Rack is a great investment for any vehicle. Both steel and aluminum roof racks are available, and along with fitting a roof rack to your vehicle, you can also select from a number of optional extras to tailor it more specifically to your load carrying needs. Top rail sits well above rack floor to ensure a secure load and is constructed from tough 25mm tube while the bottom rail utilizes 35mm tubing. An Amplimesh® alloy mesh floor comes standard on the Aluminum Series, which is used to ensure the optimum strength of each rack. ARB’s Alloy Racks utilize quality aluminum, making them 40% lighter than ARB’s Steel Roof Racks. A shorter design that fits comfortably on the roof of a dual cab pickup such as the Toyota Tacoma, ARB’s cab racks provide additional storage space for these vehicles. Featuring a fully welded rack assembly, ARB Flat Racks provide the same reliable strength and robustness of the ARB Roof Rack range, enhanced with the added practicality of a flat platform. 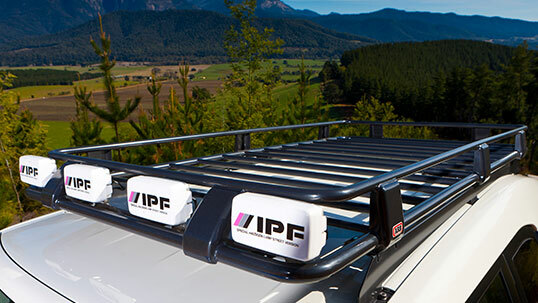 Available in alloy (featuring Amplimesh® mesh floor) or steel (with crossbars only), fitment of the ARB Flat Rack is interchangeable for any application that takes an existing ARB Roof Rack with the same dimensions.